A plantation is a large tract of farm land usually designated to grow a single type of crop. Examples include tea, banana tree, rubber, pineapple, cotton, sugar cane, coffee, tobacco and corn plantations. If you are constructing a diorama of a plantation, do some preliminary research to learn about the specific crop you will be representing. Dioramas are usually made inside shoe boxes or other similar containers. Reuse material from around the house and use some ingenuity to make the components for your diorama. Use your own ideas to create your model, but make sure to follow guidelines if it is a class assignment. Create a rough plan of your diorama on a piece of scrap paper. Research the crop you have selected or have been assigned to find out what it looks like while in the ground, the medium it is planted in, whether there is spacing between each row of plantings and whether there are any social or historical components to include. For example, if you are creating a diorama of a cotton plantation in the Southern states during the mid-1700s, you might visually describe the issue of slavery and include a large, white estate mansion with columns. 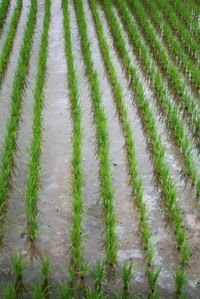 A rice plantation in Southeast Asia might include a hilly landscape of liquid paddies. A banana plantation would include tropical trees, whereas a corn plantation would include dense crops with tall, branched stems. Select a box for your diorama. Shoe boxes are often used. Diorama Man recommends choosing a box that is symbolic of your diorama theme, such as using a tea box if you are creating a tea plantation. Paint a landscape background on the back of the box, using tempera paint, or draw a background on a white piece of paper and paste it to the back. You could draw a blue sky, a sunrise or sunset. Paste cotton balls for clouds if you so choose. Cotton balls can also be used for cotton crops. Create your crops out of construction paper, card stock or air-dry modeling clay. If you are using a paper product, draw or trace images and cut them out, leaving a tab at the bottom that you can fold to stand the images up. If you are using clay, mold the items and allow to dry for 24 hours. Add hills to the landscape, if required, by rolling up balls of scrap paper or newspaper and covering them with tissue paper, magazine scraps or construction paper. Glue all cutouts on the flat surface of your diorama box. Glue the shortest items in front and the tallest items in back. Add accessories to your diorama such as plastic figurines for farmers, an estate home made out of card stock and local birds made with modeling clay.